네티비야 친구들께 샬롬의 인사 전합니다! 2018년을 마치고 2019년으로 들어가면서 저희는 정말 복된 한 해를 보내게 해주심에 하늘 아버지께 감사드리며, 아버지께서 우리가 사랑하는 이곳 이스라엘에서 우리가 하고 있는 모든 일 가운데 우리를 계속 이끌어 인도해주시기를 기도드립니다. 저희는 아버지께 우리의 동역자인 여러분 모두에 대해, 우리를 위한 여러분의 신실한 후원과 기도에 대해 감사드립니다. 하모찌는 계속해서 이곳 예루살렘의 저희 인도적 사역의 중심에 있습니다. 작년에 저희는 가난한 가정에 75,000 킬로그램의 신선한 과일, 채소, 고기, 건식품을 나눠주었습니다. 저희는 금년에 저희가 섬길 수 있는 가족 수를 늘리기를 기도하고 있습니다. 저희는 믿는 군인들을 위한 부림절 선물꾸러미를 준비하고 있습니다. 믿는 젊은 군인들이 200명 이상 있는데요, 저희가 저희와 저희 나라를 위해 희생하고 있는 이 군인들에게 작은 것이나마 보답해줄 수 있는 것은 영광이고 축복입니다. 2018년에 저희는 전년도보다 두 명 더 장학금을 주어 총 17명에게 장학금을 줄 수 있었습니다. 이렇게 할 수 있게 해주신 하나님께 감사드립니다. 콜 하예슈아 라디오방송은 계속해서 중동과 그 주변 지역 많은 곳에 복음을 방송하고 있습니다. 금년에는 하나님나라에 있어 흥미진진하고 생산적인 해가 될 전망입니다. 저희는 이곳 네티비야에서 그 일부가 될 수 있는 것에 대해 감사드립니다. 요셉 슐람 장로님은 계속해서 문자 그대로 예루살렘에서부터 땅 끝까지 주님의 말씀을 전해주고 있습니다! 장로님은 조만간 포르투갈로 가서, 5월 17~19일 아누심 컨퍼런스 (이어서 4일간의 투어)를 위한 준비를 마무리할 것입니다. 그곳에서 네덜란드로 갔다가, 그 다음에는 브라질, 미국, 유럽, 극동아시아로 가는 일정입니다. 요셉 슐람 장로님을 위해 기도해주시되, 특히 기름 부으심과 건강을 위해 기도해 주십시오. 11월에 저희는 네티비야 40주년을 축하하여, 평생 한 번 있을 열하루 동안의 이스라엘 투어와 이 특별한 일을 기념하여 축하행사를 할 예정입니다. 여러분의 카드와 축일 축복의 말씀들에 대해 감사드립니다. 저희는 다시금 여러분의 기도와 저희에게 보내주신 후원에 대해 여러분 모두께 감사드리고, 금년에도 여러분과 여러분의 가족에 하나님의 모든 축복이 임하기를 기도합니다. 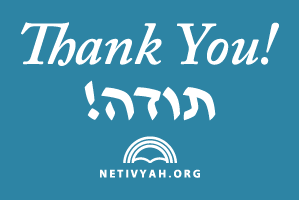 Greetings and Shalom Dear Friends of Netivyah! As we finish 2018 and jump into 2019, we want to thank our Heavenly Father for a truly blessed year and pray for Him to continue leading and guiding us in all we do here in our beloved Israel. We thank Him for all of you, our partners, and your faithful support and prayers for us. Hamotzi continues to be the center of our humanitarian work here in Jerusalem. Last year we distributed 75,000 kilos of fresh fruit, veggies, meat and dry goods to our needy families and we are praying to increase the number of families we will be able to serve this year. We are preparing the Purim packages for our believing soldiers. We have more than 200 young people participating and it is such an honor and blessing for us to be able to give a little something back to these who are sacrificing so much for us and our country. In 2018 we were able to provide 2 more educational scholarships than last year, bringing our total to 17. We thank God for making this possible. Kol Yeshua continues to broadcast the Good News to much of the Middle East and surrounding areas. This year promises to be an exciting and productive year for God’s kingdom and we are grateful to be a part of it here at Netivyah. Joseph continues to take the word of the Lord literally from Jerusalem to the four corners of the earth! Soon he will travel to Portugal, making final preparations for the Annusim Conference, held May 17-19 (4 days touring to follow the conference). From there, to Holland and in the coming year, Brazil, America, Europe and the Far East. Please pray especially for anointing and good health for Joseph. In November, we will be celebrating Netivyah’s 40th Anniversary with a once-in-a-lifetime eleven-day tour of Israel and festivities to mark this very special occasion. Thank you for your cards and holiday wishes. We thank you all again for your prayers and support to us and we pray all of God’s blessings to you and your families for this new year.